Seventeen-year-old Sunny’s always been a little bit of a pushover. But when she’s sent a picture of her boyfriend kissing another girl, she knows she’s got to act. What follows is a mad, twelve-hour dash around London – starting at 8pm in Crystal Palace then sweeping through Camden, Shoreditch, Soho, Kensington, Notting Hill . . . and ending up at 8am in Alexandra Palace. Along the way Sunny meets a whole host of characters she never dreamed she’d have anything in common with – least of all the devilishly handsome Jean Luc and Vic. But as this love-letter to London shows, a city is only a sum of its parts, and really it’s the people living there who make up its life and soul. As a born and bred Londoner, I was really looking forward to reading this book, and hoped it would provide a realistic and fun reflection of the city. So begins a completely mad dash around London as Sunny tries to track down the naughty boyfriend. On her journey she meets a fabulous cast of characters and rides on just about every form of transport possible – including some stolen bikes. The action is quite relentless, and although it is a bit silly and unbelievable at times, it really is a fun ride! You never quite know what is coming next which is what makes this such an enjoyable novel – and what I really enjoyed was the way Sunny’s character develops and gains confidence throughout the novel. It also deals with issues of race, sexuality and identity, but in a subtle and endearing way – there are no ‘in your face’ statements, people just are who they are. This is a novel about friendship, individuality and fun – but at the heart of the novel is a love letter to London. 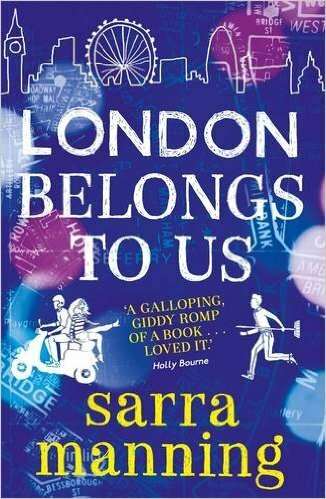 I did think this was a really accurate portrayal of London and I liked a lot of the detail that was included, which showed that the author knows the city well. This is in complete contrast to another young adult novel I read earlier this year that was also set in London, but might as well have been set in the Cotswolds for all the resemblance it had to the city! Instead, this is a pretty authentic tour of the streets – busy, dirty, full of crazy characters, sometimes dangerous but always interesting. The narrator also grew up in the same part of London as me, hung out in Camden, as I did as a teen, and had grandparents in Ladbroke Grove, just like me, and I loved recognising some of the descriptions of these areas – even down to the bus routes! Overall this is a really fun book, and the kind you want to read in one sitting so you don’t lose momentum. It’s set over less than 24 hours and I liked that there was no “three months later” epilogue or similar – it worked for me that everything was packaged together over the course of this one eventful, hectic, crazy day. This is a really enjoyable young adult novel – it’s pretty simple and there isn’t a fantastic plot or incredible twists, but it is just a fun, light-hearted, endearing read.